Got Buzz @ Kurman Communications: Don't forget "A Night in Support of Haiti" tomorrow night! Don't forget "A Night in Support of Haiti" tomorrow night! Tickets are still available but going fast for Erie-LaSalle Body Shop's "A Night in Support of Haiti" 75th anniversary party, happening Friday, Feb. 26 from 5:30 p.m.- 9 p.m. at Martini Park (151 W. Erie St.). Admission is $40 in advance ($50 at the door) and grants access to the open bar with wine, beer and specialty cocktails like the Erie Latini, Fender Blender, Haitian Mojito and more. Martini Park is also providing some of its signature appetizers to be passed during the party. 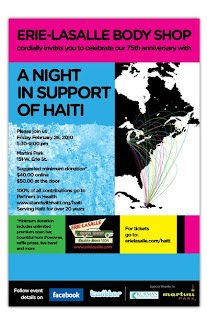 Tickets can be purchased at www.erielasalle.com/haiti. Special announcements will be made at 7 p.m. including an appearance from Illinois Governor, Pat Quinn. Guests will also be able to purchase raffle tickets for a chance to win exciting prizes including a one-hour flight in an L-39 fighter jet donated by Bill Wert of Gauntlet Warbirds, plus gift certificates to Chicago's favorites restaurants like Mercadito, Wildfire, Keefer's, Fogo de Chao and Gino's East. Other prizes include a personal training session as well as a personal organizer session. All proceeds from "A Night in Support of Haiti" benefit Partners in Health, a charity that has been working on the grounds of Haiti for more than 20 years. For more information about Partners in Health, visit www.standwithhaiti.com. Erie-LaSalle Body Shop is celebrating 75 years as Chicago's premiere automotive repair business. Erie-LaSalle Body Shop is third-generation owned family business priding itself on quality customer service and quality craftsmanship, receiving the I-CAR Gold Class Professional certification. For more information, visit www.erielasalle.com.